HELPING YOU TO BECOME A HEALTHIER PERSON! 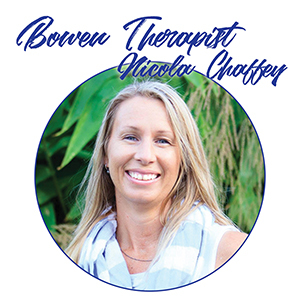 Nicola is a professionally registered therapist with the Bowen Association of Australia (BAA), she is committed to meeting the annual CEU requirements to maintain the standard of her services and to ensure her clients receive the best possible treatment with the latest scientific advances in Bowen Therapy. We recognize that every client is unique, and are committed to helping people reach and maintain their health goals from the inside out in a genuine, caring environment. Gut health is vital for good health. We can help restore organ function to ensure your body is absorbing your nutrient uptake efficiently, thus preventing a broad spectrum of health conditions, which can be caused by a compromised digestive system. By treating the body as an integrated whole unit we provide effective injury prevention and recovery for athletes wishing to improve and maintain peak performance. Quality one on one care to relieve pregnancy related conditions and provide post-natal support for optimal healing and physical well-being. We offer children the best possible start in life by providing a gentle form of therapeutic bodywork that not only keeps their mind and body happy and healthy, but aligned too. Nicola is an approved practitioner in the McLoughlin Scar Tissue Release Technique. Scarring, from surgery such as caesarean sections, hysterectomies, appendectomies, knee replacements and traumatic scars can cause pain or numbness in the scar area, pain or lack of sensitivity in other areas not obviously seen to be connected to the scar.